Crunchy and creamy at the same time. Preheat oven to 200 degree F.
Heat in in a pan until it registers 375 degrees F on a deep-fry thermometer. While oil is being heated, mix flour and salt in a shallow plate. Put beaten eggs and bread crumbs in two separate shallow plates. Peel avocados, remove the seeds and slice into 1/2-inch wedges. 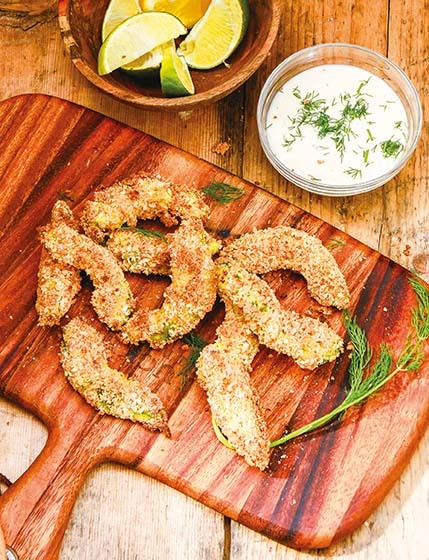 Dip avocado in flour, making sure to shake off excess flour. Dip in egg, then panko to coat. Set on 2 plates in a single layer. Fry several wedges of avocado slices at a time until deep golden – 30 to 60 seconds. Transfer fried slices to a plate lined with paper towel and keep warm in the oven while frying the remaining wedges. Preheat the oven to 425°F. Line a baking sheet with foil and top with an oven-safe wire rack. Put flour, the beaten eggs, and breadcrumbs into separate shallow plates. Mix 1 tablespoon of the jerk sauce into the flour with a fork. Peel avocados, remove the seeds and cut into 1/2-inch wedges. Dredge avocado slices first in the flour mixture, then the egg, followed by the breadcrumbs. Place the avocado slices on the wire rack and sprinkle with the remaining teaspoon of jerk sauce. Serve with your mayo or dipping sauce of choice. Variation: Substitute barbecue sauce for the jerk.